Books > Language and Literature > Kamasutra > The Kanyakubja Gauda Struggle – From the 6th to the 12th Century A.D. The present volume is the reprint of the book by Professor D.C. Sircar published by the Asiatic Society in 1985 and contained the text of Dr. Biman Behari Majumdar Memorial Lecture delivered by Professor Sircar in 1982. I hope the reprint would be useful to the scholars and students of the field. Asiatic Society feels extremely happy to bring out this learned monograph of Professor D. C. Sircar. Professor Sircar, one of the foremost Indologists in the world, delivered the Biman Behari Majumdar Lecture of 1982. The present volume is an outcome of that series of lectures. The subject of the monograph is of immense historical importance and interest. The complexities of the Tripartite- Struggle have been a subject of intensive historical research for many years. Eminent historians have written on this topic. Yet, many problems have remained unsolved. Vital data have been missing. Professor Sircar has exhaustively discussed with his usual thoroughness and analytical mind the different aspects of the long drawn struggle for political hegemony In Northern India. The result has been most rewarding for all researchers and students of Indian history of this period. So far, scholars had primarily concentrated on the tussle among the Palas, Pratiharas and the Rastrakutas. 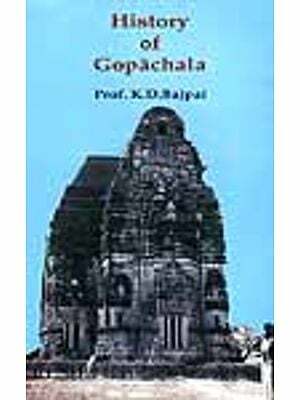 By including and throwing new light on such aspects as the importance of the Ayudhas. The problem of the Harsa Era, and the relations among the Gahadavalas, the Palas and the Senas, Professor Sircar has added a new dimension to the study of the subject. One of the major purposes of the Asiatic Society is to publish works of exacting academic standard. We are grateful to Professor Sircar for giving us an opportunity of publishing such a monograph. We are also grateful to him for undertaking the responsibility of supervising the printing-work of the book himself. But unfortunately his repeated illness and sad and sudden demise on January 10, 1985, did not allow him to see it entirely through the press. 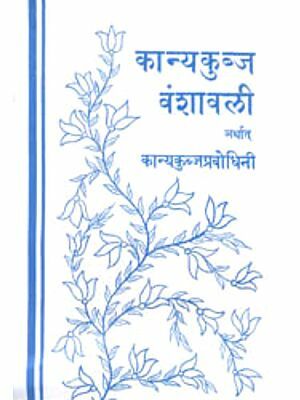 A member of our Publication Committee Dr. Samaresh Bandyopadhyay has supervised the printing work of the remaining par to the book. Our sincere thanks are due to Dr. Bandyopadhyay. Professor D.C. Sircar’s monograph. I am sure, will be widely appreciated by scholars in the field and by his peers. 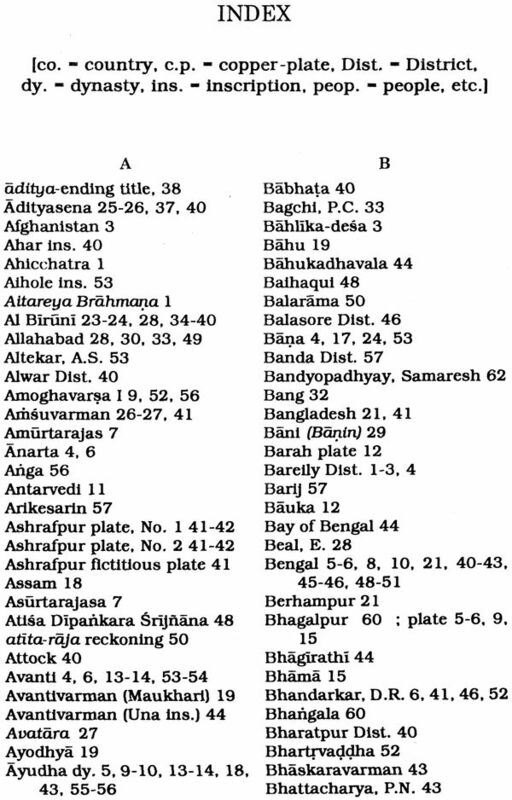 While publishing the results of my study of the Dubi plates of king Bhaskaravarman (c. 600-50 A.D.) of Kamarupa with particular reference to the light thrown by the Inscription on the struggle between Gauda and Kamarupa in the sixth and seventh centuries A. D.. I drew attention, more than thirty years ago, to a theory of the ancient Indian politicians and Its bearing on the various states rising out of the ruins of the Gupta empire. It was believed that a king (say A) has his natural enemy in the neighbouring ruler (say B) while the ruler (say C) of the territory beyond that of the enemy king (i.e.. B) was a natural enemy of his Immediate neighbour but a natural friend of the distant neighbour (i.e., A) ; and so on. 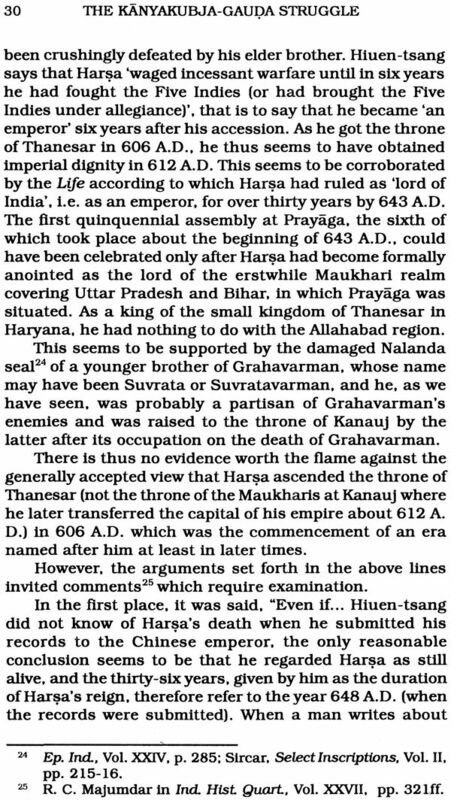 On the fall of the Gupta empire, about the Gupta year 231(550- 51 A. D.) according to a Jam tradition, their Maukhari feudatories, who became independent at Kanauj (ancient Kanyakubja, Kanyakubja. Kanyakubja, etc. ), were enemies of their eastern neighbours, the Gaudas of Bengal. as well as of their south-western neighbours, the Later Guptas of Malaya (i.e. East Malwa). The Gaudas, on the other hand, were not only the enemies of their western neighbours, the Maukharis, but also of their north-eastern neighbours, the Bhauma-Lvarakas of Kamarupa (Assam), and at the same time, they were friends of the Later Gupta enemies of the Maukharis. It seems that the Maukharis and Bhauma-Narakas were friends of each other because they were both enemies of the Gaudas. The Later Guptas were originally friends of the Pusyabhutis of Thanesar; but this relationship was disturbed about the beginning of the seventh century A.D... So that the Pusyabhutis allied themselves with the Maukharis. In this case, a so-called natural enemy’ became a friend on the change of circumstances. While the Gaudas were succeeded In Bengal and Bihar by the Palas and Senas (eighth to thirteenth century), the kingdom of Kanyakubja or Kanauj (Kanol) passed from the Maukharis first to the Pusyabhuti king Hara (seventh century). next to the Maurya house of Yasovarman (eighth century) and then to the Ayudhas (eighth-ninth century). Gurjara-Pratiharas (ninth to eleventh century) and Gahadavalas (eleventh-twelfth century). 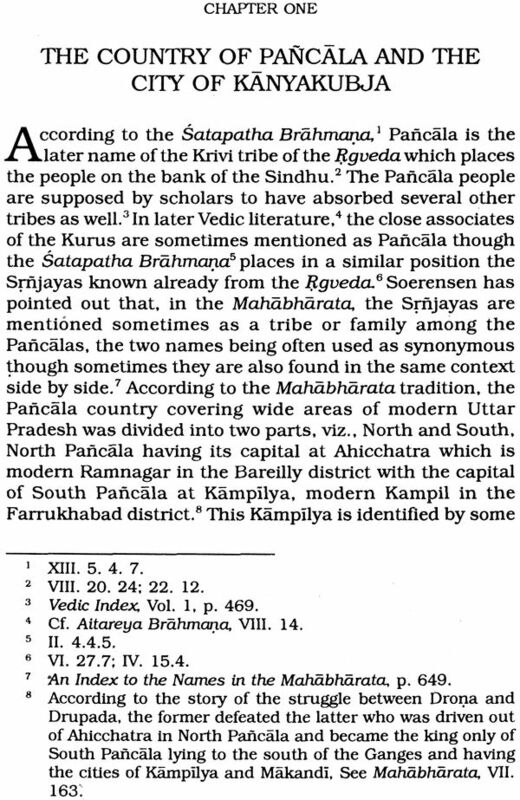 But the Kanyakubja-Gauda struggle continued throughout the centuries. 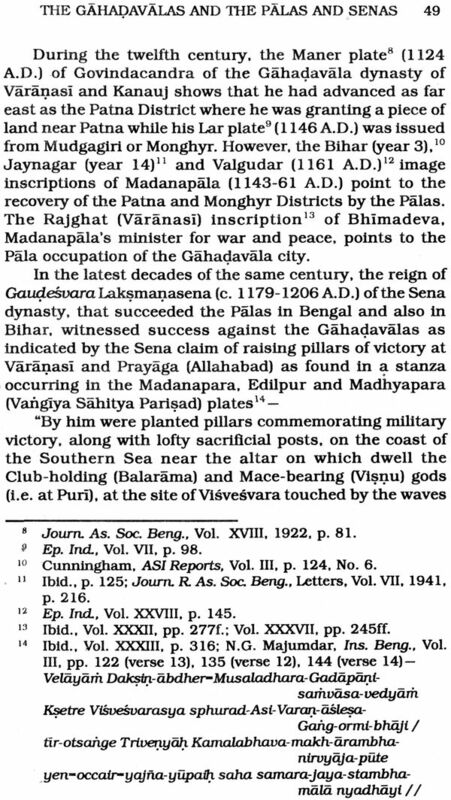 The latest event associated with the struggle is the Sena claim to have raised pillars of victory at Varanasi and Prayaga in the dominions of the Gahadavalas as found in the records of I.aksmanasena’s successors who ruled in the eastern areas of Bengal in the thirteenth century A. D. However, the Sena-Gahajavala struggle must have ended sometime before the Turkish Musalman occupation of the western part of Laksmanasena’s empire, the date of the Muslim conquest of Gauda being known from the gold Tanka issued by Ikhtiyaruddin Muhammad bin Bakhtiyar Khalji in the name of Muizuddin Muhammad bin Sam to have been the 19th Ramazan in the Hijri year 601 which corresponds to the 10th May. 1205 A.D. As a matter of fact, the Gahadavalas had been subdued by the Turkish Musalmans more than a decade earlier, so that the struggle could not have continued beyond the twelfth century A.D. However, strained relationship between Western Uttar Pradesh region and Bengal has been traced even in the medieval and modem times as well. The history of the Gauda-Kanyakubja struggle is of considerable importance since certain wrong theories have been propounded by historians without having a clear idea about it. One such belief is that the three great powers. viz., the Palas. Gurjara-Pratiharas and Rastrakutas, were struggling for the supremacy of North India or for the occupation of Kanauj but we have tried here to show that neither did the above powers fight with a singular purpose nor had Kanol acquired a halo of imperialism and was coveted by adventurers as a result thereof before the middle of the ninth century A. D. While the Pratihàra-Rã4rakUta struggle began far away from Kanauj, It became one of the greatest cities of India only under the two centuries of Gurjara-Pratihara rule. We have also bled to show how the great extent of the Ayudha kingdom has so far remained unrealised by our historians. When sometime ago I was invited by the General Secretary of the Asiatic Society. Calcutta. to deliver the Dr. B.B. Majumdar Memorial Lectures for the year 1982. 1 readily agreed to do so because the late Dr. Majumdar was not only a reputed student of history and political science. but also a valued and respected friend of mine, and it was impossible for me to ignore the opportunity offered to me to pay homage to the memory of my late lamented friend. In April, 1978, 1 delivered some lectures at the Department of Ancient History, Culture and Archaeology of the University of Allahabad as a Visiting Professor there. A few of the topics discussed in the present series were touched in one or two of the lectures delivered on that occasion.